Lot of news coming out of Adams Morgan this week. And even more BBQ news this week. Yesterday I received a panicked email from a reader titled, “Asylum leaving top space? !” citing a brief City Paper post via The 42. Asylum offers a vegetarian/vegan friendly food menu, daily drink specials, an internet jukebox, and live entertainment in a low-key atmosphere. Happy hour runs from 5-8pm daily that includes $1 off rail drinks and draft beers, .50 wings and $1.50 tacos. Asylum offers meat selections as well, a great place to go to satisfy everyone’s palate. Best known for the vegan brunch on Saturdays and Sundays, please come by from 11-4pm and enjoy the weekend chef specials and our house-made bloody mary’s, vegan huevos rancheros, pancakes and French toast. Voted best vegan brunch by VegDC.com and Best of Washington. The Saturday Natty Light countdown is legendary. On Wed. afternoon I had the opportunity to talk with Asylum owner (and Meridian Pint owner) John Andrade to get all the details. So first of all it is true that changes are on the way – Asylum will be rebranding the upstairs bar. But for those concerned that another jumbo slice purveyor would be filling the space, fear not, it is going to become a craft beer establishment featuring BBQ. 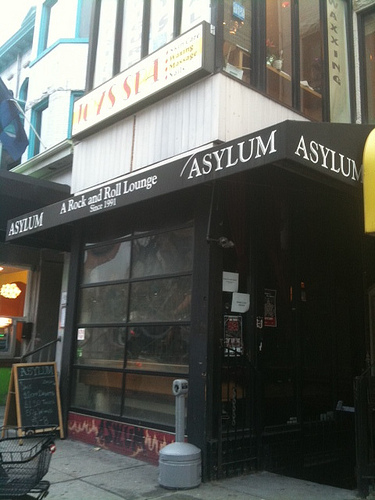 But perhaps equally important is that Asylum the bar will remain in the basement space. All the details including a chance to win a $1000 credit to the upstairs bar after the jump. Since Asylum is “an incredible institution for 20 years now”, Andrade says, it’s not going anywhere and will continue to reside in the basement bar. However, with the craft beer scene exploding in DC, Andrade, believes that the transformation of the upstairs is essential to continue to be successful. Asylum’s downstairs space will have one slight change – the pool table will be removed in order to make some room for more seating. Aside from that and a “fresh coat of paint” the downstairs space will remain the rock and roll, veggie serving bar that it is today. Now for the upstairs. It will take a new name. And here’s a pretty cool opportunity – John will host a competition for you guys to name the bar. And you get a lot more than bragging rights, the winner gets a $1000 credit to the new space. You can leave your entries in the comments here and/or a new facebook page for The New Asylum. More about upstairs. As I mentioned it will be a craft beer establishment but in contrast to Meridian Pint it will not only have American craft beers but international ones as well. There will be 30-35 beers on tap and the size will remain the same with an occupancy of 75. While the space will continue to have its own separate entrance it will also continue to connect to the downstairs on the inside as well. The two spaces will share the same upgraded kitchen. Ah the kitchen. 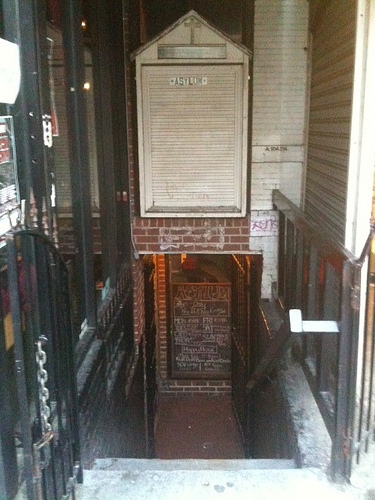 While downstairs you can still get the classic Asylum fare – upstairs will be BBQ-centric. While the emphasis will be on craft beer, Andrade sums up the upstairs as focusing on “beer, bbq and whiskey”. Now – when is it gonna happen? Andrade is going on his honeymoon in early June and plans on starting the upstairs facelift soon after he returns. The facelift is expected to take 3-4 weeks so the new space should open around late July. In the meantime Asylum upstairs and downstairs will remain open and you have until May 1st to come up with a winning name for the space upstairs. So, do you guys think a craft beer establishment focusing on bbq will be a good fit for the upstairs space? Do you think the basement space will be able to maintain its character?